There are a hundred and one excuses for having no personal work to show you today, and I know you do not want to hear them. For a change I will tell you a story…..
About half a dozen years ago, an elderly aunt decided she would travel to Belfast by train and meet me for lunch before returning home in the evening. The day was bright warm and sunny and we sauntered about the town when we had eaten our fill. My aunt suggested walking to Central Station to catch the Dublin train. As we walked, I shared with her the news that I had a new man in my life. Suddenly with great interest my aunt subjected me to a cross examination more suitable to the Laganside Courthouse that we were than passing. I was able to tell her that this man was not very tall, mature with his eye well focused on the way ahead. She seemed pleased. “Where did you meet him?” she enquired. “Here in Belfast.” I told her adding “In fact I may have the opportunity to introduce you, if we quicken our step!” Soon she was tottering on her heels bubbling with excitement at the prospect of meeting my new beau. “There he is!” I declared as we crossed the street from the Courthouse to the front of the Waterfront hall. 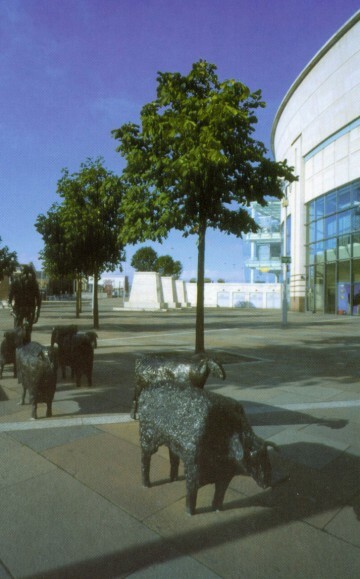 Suddenly her face clouded as I pointed to the sculpture of the Shepherd walking his sheep to market! 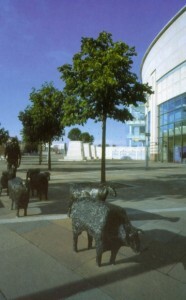 Sheep on the Road 1991 by Deborah Brown at the Entrance to Waterfront Hall, Lanyon Place, Belfast. 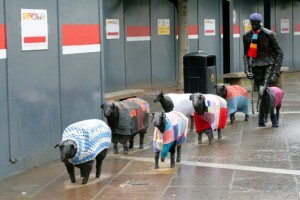 A group of skilled knitters will take to the streets during August to wrap their creations around public property like trees, street signs and lamp posts, covering the streets of Belfast in woollen ‘tags’. Now I need to charge up some batteries and dust off the camera! This entry was posted in Crafts on July 21, 2010 by Grannymar.